I do not have the time or motivation to cook complicated plant-based recipes by Dr. Fuhrman. I have done it a few times, but it is not a sustainable habit for me. So, I almost 90% of the food I eat is raw. And, of that 90%, at least 75% of that is salad-based. 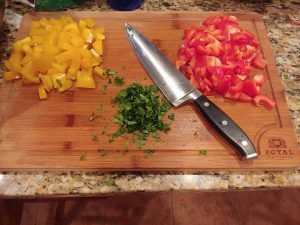 I find it is the fastest, simplest way for me to create meals in bulk. 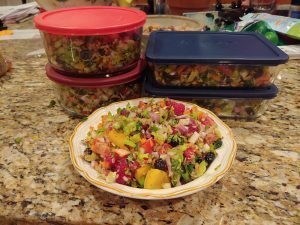 So here’s an example of how I create a salad that I divide into 5 meals over 3 days. 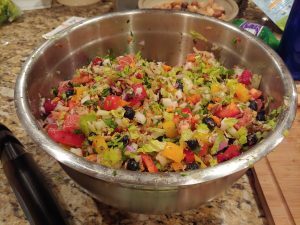 The fundamental basis of my salad creating is “What is in the fridge?” For this salad I had a wide variety of greenery and other goodies to choose from. This is not always the case and often my salad is couple of heads of romaine and a couple of other veggies. So please do not walk away from this with the idea that all of my salads are this busy and rich. First, and foremost when it comes to salad ingredients are the greens. In this case, I used 2 heads of romaine (ANDI 510) and 3 heads of bok choy (ANDI 865). Per Dr. Fuhrman, I chop the greens up really small so I don’t need to chew them so much. Chopping also activates lots of enzymes and phytochemicals in the greens to make the nutrients more bioavailable. Now for the extras! You’ll notice in the image above, I like to include fruit in my salads. 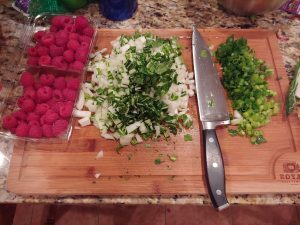 Raspberries (ANDI 133) are somewhat nutrient dense and add a sweetness/tartness that breaks up the mundane flavor and texture of a salad. There are 4 bunches of green onions chopped up in that image also. Green onions (ANDI 173) are a milder way to get some G-BOMBs into your salad. Although later you’ll see that I included more onions! I love me some bell peppers! Nutritious red and yellow bell peppers (ANDI 224), 1 of each, add vibrant color, juiciness, and sweetness to a salad. We had some cilantro (ANDI 481) leftover from another meal, so I decided to throw that in. Cilantro is a micronutrient powerhouse and when mixed into this busy salad, I could not even taste it. 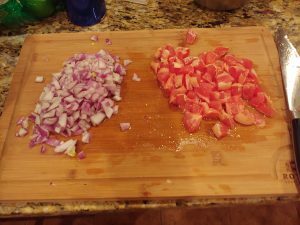 Next up, I chopped 2 medium raw red onions (ANDI 107) and 2 pink grapefruits (ANDI 120)! What a weird combination, but I had both of them handy and decided to go for it. The grapefruit added more sweet/tart juice to the salad so that I almost did not even need a dressing. A QUICK WORD ON ANDI SCORES: They are not the end-all-be-all of deciding what are the healthiest foods. They are part of the information we use to choose our food. There are thousands of micronutrients, phytochemicals, and enzymes contained in whole foods that no single score will ever be able to completely capture. So use the ANDI score as a guide — it is an excellent one. Another weird salad addition? Sauerkraut 1.5 cups. 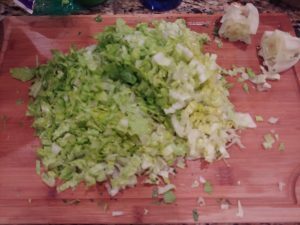 Raw cabbage has an ANDI score of 352, but I am certain fermented cabbage has a higher score than that thanks to the microbes making tons of additional micronutrients during the fermentation. SECRET TIP: Strain the sauerkraut before adding it to a salad. 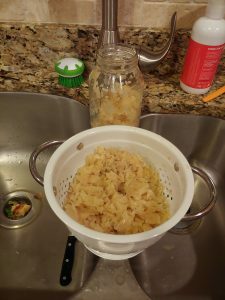 Put it into a strainer and then use a bowl to press the kraut and get as much of the juice out of it. Catch that juice and drink it!! 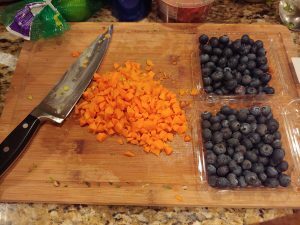 Blueberries (ANDI 132) and 1 cup (chopped) baby carrots (ANDI 384) are next. Why? Again, because we had them in the house. Now, baby carrots are not as micronutrient dense as regular carrots because they are missing the peels. 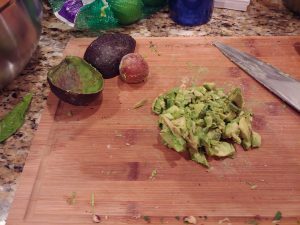 Now, the last 2 pictures show ingredients that anyone trying to lose weight should use sparingly — avocados, nuts, and seeds. First, the avocados (ANDI 28). I used 2 for this salad. Remember, this is a salad that will be divided into 5 separate salads. Avocados add creaminess and richness, along with some good plant-based fat. Chop them us and just stir them in. Finally, the nuts and seeds portion of the program. Again, be careful with these while trying to lose weight. Raw walnuts (ANDI 30) add some meaty flavor and make this a very filling salad. I used about 1.5 cups. Sunflower seeds (ANDI 64) provide tons of minerals and a gentle crunchiness. I used about 1/2 cup. The ground flax seed (ADNI 103)/chia seed (ANDI 77) blend is one of my favorites to add to salads and smoothies. I used about 1/4 cup for this salad. Mix it very, very well in a ginormous bowl and doesn’t it look pretty! This took me about 30 minutes to prepare, but that takes care of 5 salads so return of investment is huge. 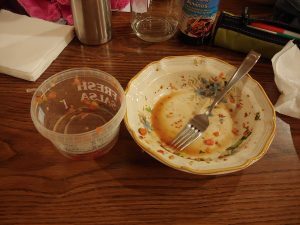 Divide it into whatever clean pyrex containers are not already being used for other leftovers and pray you can find the lids (That’s a side rant about pyrex lids. Those things disappear faster than socks in the dryer!) The bowl in front is the portion I eat right away. A few days of salad! 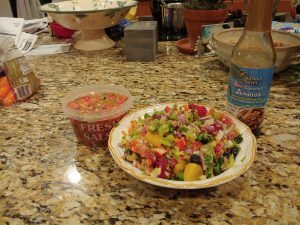 Then I sit down with my lovely, amazing family and enjoy this salad with my most favorite salad topper — pico de gallo (Not sure what the ANDI score is but it’s onions, tomatoes, peppers, and cilantro)! That’s right…I am adding even more onions! G-BOMBS!!! Yes, I eat the entire container of pico. Then I sometimes top it with a little dab of coconut aminos. After that meal I am full and micronutrient-saturated! October and November mark the onset of the flu season. The CDC (Centers for Disease Control and Prevention) recommends that everyone 6 months and older get a flu vaccination before the end of October to protect yourself from catching the flu. But before you rush out to get a flu shot, I want to make sure you know about the effective all-natural alternative to flu vaccinations available to you here at LHHP. High-dose multi-vitamin infusions strengthen your immune system, aid in detoxifying your body, and revitalize your energy levels so that you are less susceptible to flu, colds and other illnesses as well. The flu can a be very serious illness. 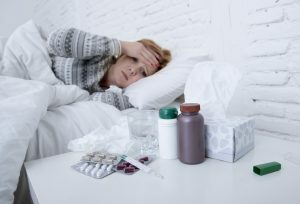 Here in the United States, more than 200,000 people are hospitalized each year with the flu or with flu-related complications. And I have seen estimates that more than 36,000 people die from the flu each year. Flu vaccines are hit or miss when it comes to protecting people from the flu. Getting a flu vaccination doesn’t provide guaranteed protection against the flu because there is no way of knowing for sure which flu viruses will be circulating in any given year. Our intravenous (IV) nutrient therapy patients report remarkable health benefits from our high-dose multi-vitamin and mineral infusions. For athletes, our IV nutrient therapies can also enhance sports performance and recovery. 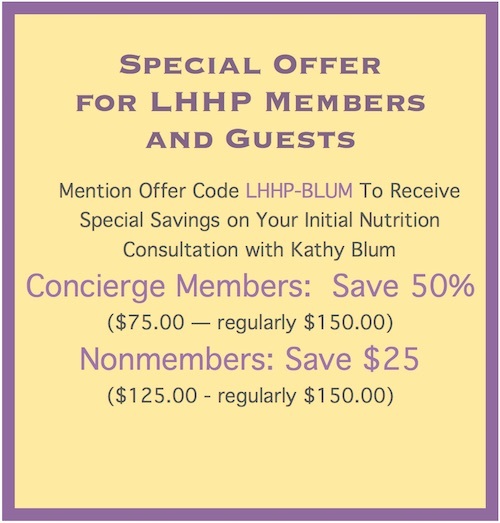 at no additional charge as part of your membership. IV Vitamin Infusions are also available to the general public. Call our office at (703) 779-2801 for more information and to schedule an IV Vitamin Infusion appointment.